Francis Wheen has 1 media appearance. Francis Wheen discusses Karl Marx. 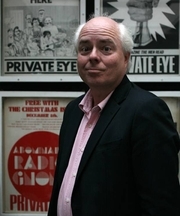 Francis Wheen is a prolific freelance journalist and broadcaster, and has worked for the New Statesman, Independent, Mirror, Gay News, Today, New Socialist and Tatler. Having presented News-Stand on BBC Radio 4 for a number of years, Francis has appeared often on ITV's What the Papers Say and more recently on BBC2's Have I Got News For You. He is now the writer of Wheen's World a regular column appearing in the Guardian – for which he was voted Columnist of the Year. His previous books include The Sixties (1982), Television (1985), The Battle for London (1985), Tom Driberg (1990) which was shortlisted for the Whitbread Biography Award, and the bestselling How Mumbo Jumbo Conquered the World (2004). Karl Marx was published by Fourth Estate in 2000 and was shortlisted for numerous awards including the WH Smith Literary Award; the Samuel Johnson Prize; the Orwell Prize; the Silver Pen Award; and the Marsh Award. Francis Wheen's book Strange Days Indeed: The 1970s: The Golden Age of Paranoia was available from LibraryThing Early Reviewers. Francis Wheen is currently considered a "single author." If one or more works are by a distinct, homonymous authors, go ahead and split the author. Francis Wheen is composed of 3 names. You can examine and separate out names.